On 4 June 2018, on the occasion of the 29th anniversary of the Tian’An Men Square protests, the Wei Jingsheng Foundation organised a conference to discuss China’s growing influence power over Western countries with a special focus on People’s Republic’s misuse of Interpol red alerts to obstruct the work of peaceful activists. 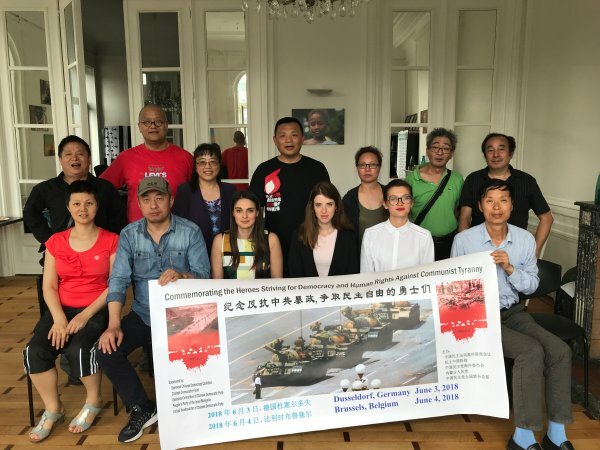 Taking place at the UNPO office in Brussels, the symposium gathered Chinese activists and democracy defenders such as Ms Huang Ciping, UNPO Vice-President and President of the World Uyghur Congress, Mr Dolkun Isa, and Open Dialog Foundation Representative, Ms Paola Gaffurini. Sakharov Prize Laureate Mr Wei Jingsheng was not able to attend the event due to visa issues despite the personal invitation that he had received from the European Parliament, as was underlined by Ms Huang Ciping. UNPO Advocacy Officer Ms Lucia Parrucci opened the symposium by discussing evidences of Chinese interference with international organisations and national governments, especially in Europe, underlining how China is becoming increasingly confident in promoting its authoritarian ideas beyond its borders. While doing so, China has three different targets: media, academics and, of course, politicians. The Chinese government exploits the need of the European Union for economic investments and foreign capitals to manipulate decision-making processes within the Union through the (mis)use of political pressure, and financial donations, thereby fostering fear and corruption among politicians. By targeting European media, China polishes its image and spreads its ideology and ideas more easily, in particular through the sponsoring of advertisements, but also by producing content focussed on China and the alleged opportunities the country offers. Cases in point are recent publications in The Figaro (France), Le Soir (Belgium) and The Telegraph (United Kingdoms). According to Ms Parrucci, this strategy can also be observed at the European Parliament where issues of China Daily are distributed on a daily basis. China also funds many academic organisations, among which are two new Confucius Institutes in Brussels which opened in 2016, the Brussels Academy for Chinese Studies and the EU-China Higher Education Research Center, hosted by the Vrije Universiteit Brussel (VUB). Ms Parrucci underlined the lack of awareness on this issue. Although some positive changes are visible, particularly regarding politicians’ awareness on the issue, international and diplomatic organisations need to be more vocal in order to compensate for their lack of action and the failure to take a clear stand. Given the creation of the so-called “One Belt, One Road” Committee at the Parliament, the organisation of the EU-China Tourism Year in collaboration with the European Commission and the increasing influence of institutions such as Brussels’ China Cultural Center, 2018 seems to be far from being a year of a substantial paradigm shift in Europe. This makes it all the more crucial for human rights and democracy activists to come together and unite politicians under one common purpose in order to gain enough influence to counterbalance Chinese interference. Being the next speaker to take the floor, Uyghur activist Mr Dolkun Isa described his own experience of being subjected to Chinese persecution and in what ways, in the past few years, he had been affected by China’s influence over political institutions. First, he talked about the several instances when he had been forbidden to enter the premises of the United Nations to attend the UN Permanent Forum on Indigenous Issues. He then mentioned his detention in Italy shortly before he was supposed to deliver a speech at the Italian Senate in 2017, highlighting how his voice had been shut down despite being in a European democracy and a German citizen. He also brought up the so-called Red Notice which Interpol – under the leadership of the agency’s Chinese President - had falsely subjected him to for decades, thereby urging member countries to arrest and extradite him. This issue was then further elaborated on by Ms Paola Gaffurini who is an Advocacy Officer for the Open Dialog Foundation. She explained that in non-democratic regimes, Article 3 of the Interpol Constitution is not respected. Indeed, the article that enshrines the organisation’s neutrality states that “it is strictly forbidden for the Organization to undertake any intervention or activities of a political, military, religious or racial character.” To make things worse, in most cases abusers of the Interpol system do not face any consequence for this misuse – even though, as is the case with China, these abuses are not singular incidents, but rather systematic manipulations of the system. This leads to the harassment of individuals such as the Chinese students who have witnessed the Tiananmen Square massacre in June 1989. Two of them shared their story during the conference and reaffirmed China's ability to pressure its people abroad, even though they have been forbidden to step a foot on the Chinese territory. They are under regular surveillance and time to time receive threats from the authorities. In 2018, the European Parliament is celebrating the 30th anniversary of the Sakharov Prize. However, as mentioned by Ms Huang Ciping, by cooperating and turning a blind eye to China’s attempts to influence international and European decision-making processes to serve its own economic and ideological interests, Western countries are closing the door to democracy and freedom and opening it to corruption. Indeed, China does not hide its willingness to bring systemic change within international institutions as shown by its recent attempt to impose its own vision of the human rights system, threatening the fragile democratic balance that the world’s civil society tries to maintain.